If there's one thing that is guaranteed to grab my attention, it's Sherlock Holmes-related books. So The Baker Street Phantom was off the shelf and paid for almost as soon as I saw it. I do have high expectations of anything Holmes-related though, so how did this one hold up? I wanted to like this, I really did. And at first I thought I would. 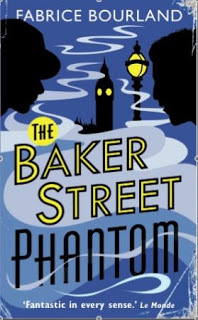 The Baker Street Phantom follows Messrs. Singleton and Trelawney as they attempt to solve a series of strange events at 221 Baker Street: is it truly a haunting, and how does it relate to a series of grisly murders in London? As a synopsis, it's fantastic, with the potential for a multi-strand mystery and the exploration of the more mystical side of Arthur Conan Doyle's life. And then it just sort of got everything wrong. So, the story is kicked off by a visit from Lady Conan Doyle who believes that her husband's ghost is haunting the house that has been renumbered as 221 Baker Street. So far so good: the mysticism aspect is introduced because of her belief, and the possibility of a more rational explanation is present. Lady Conan Doyle then states that she believes that the haunting is linked to several recent murders, many of which are reminiscent of literary villains. Now, I don't necessarily mind that she brought it up, as it might seem connected to her; what I don't understand is why Singleton and Trelawney automatically accept this, with no proof whatsoever. From then on the plot just gets sillier and more absurd, to the point where I have to call false advertising: the blurb promises something akin to a cosy mystery, whereas it actually turns into more of a supernatural romp, certainly not what I thought I was buying. Another failed aspect of the novel is the characterisation of Singleton and Trelawney, as it is pretty much absent. Both can be summed up in a sentence. Singleton is the cynic-turned-believer obsessed with the mother he never met. Trelawney is the useless member of the group that no-one can bear to turn away because he's just so gosh darned nice. It honestly feels like they're the fifth and sixth wheels in their own book, which is never a good thing. Next review: Paris Noir edited by Aurelian Masson.